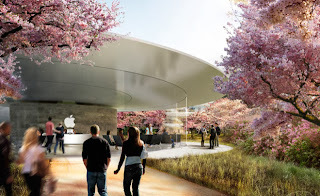 The most realistic and detailed images yet of Apple’s new spaceship headquarters have just been published on Wired. At this point, there’s a good chance you’ve seen pictures of Apple’s proposed new headquarters — a 2.8-million-square-foot spaceship parked in a verdant man-made forest in the northeast corner of Cupertino. Since the first dozen or so renderings trickled out in 2011, however, we haven’t gotten a much better sense of what all the new campus will entail or what it will be like to work there. Until now. Apple may be known for its secrecy, but buried in Cupertino’s municipal archive is a wealth of detail on the project — including more than 20 previously unseen renderings of the new campus. The latest images of the 2.8 million square-foot campus show an expansive cafeteria, an underground parking garage, and a subterranean auditorium where forthcoming Apple products will be unveiled to the media. 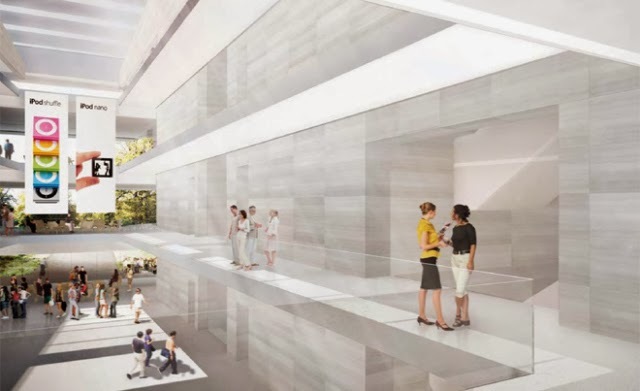 The office will sit on a 176-acre plot of land, most of which will be dedicated to indigenous flora and fauna to act as a barrier between the floor-to-ceiling glass walls and the outside world. It's planned to have a separate facilities outside of the main campus for Research & Development. Apple Campus 2, which was approved by city officials last month, will sit on a 176-acre plot in the South Bay city of 60,000 — a site that was once home to HP and Compaq. If you’re an Apple employee who drives to work, you’ll enter the campus at a freshly constructed security point at North Wolfe Road, on the west edge of the site. The lucky ones will quickly be diverted into a discrete, futuristic tunnel, where a subterranean service road will give them access to a two-level, 2,000-space parking garage underneath the mothership itself. Otherwise, you’ll have to wind your way to the south edge of the campus to the above-ground parking garage — a pair of emory board-shaped structures, clad with solar panels and foliage. If you take advantage of Apple’s shuttle buses from elsewhere in the Bay Area, you’ll be dropped off at the “Corporate Transit Center” on the eastern edge of the site. From there a walkway, flanked by two Apple Store-white staircases, will lead into the mothership itself. 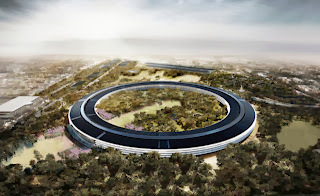 You can have a look inside the new Apple campus, and make sure to check out Apple CFO Peter Oppenheimer’s presentation after the approval of the campus, and/or Steve Jobs’ initial presentation to the city of Cupertino. I understand Twitter. Twitter is not chat or IM. Twitter is not a replacement for email. And Twitter is not the end of SMS. Back in December 2009, the number of tweets per month on Twitter reached 1 billion for the first time. 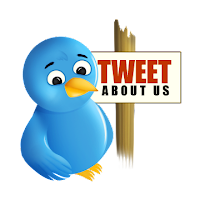 Now in May, we reached yet another milestone: 2 billion tweets per month (or to be precise, 1.99 billion, which is close enough). 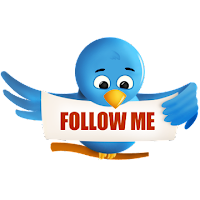 Twitter is still innovating - a partner ad platform and usability enhancements - my prediction (June 2010) is that Twitter will be acquired and morphed into a new Social Media platform in the next 2 years. But now it continues to grow at a fast pace. Twitter is has gained critical mass and is going to disappear anytime soon. According to Twitterholic, Britney Spears, Ashton Kucher, Ellen DeGeneres, Lady Gaga and Barack Obama make up the top 5 most followed people in the world using twitter. These 5 people have more than 20 million people following them. Maybe Twitter will morph into something else in a few years. But this is the internet – that’s practically a given. In the meantime, I am happy to tweet every whimsical thought I have.